- Output Timing Extend & Delay. - Separate Power, Detect and Fault Indicators. 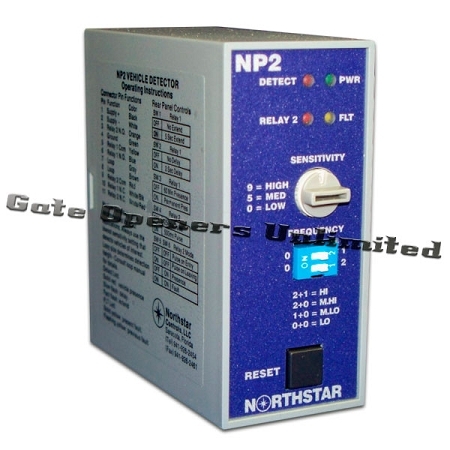 The NorthStar Loop Detector - NP2-12/24 Single Channel has been specifically designed and engineered for use in the Parking/Access Control industries. With standard operations including programmable pulse and presence options, fail-safe or fail-secure operation, compatibility with all radio controls, timing features and more, the NP2 covers your detection needs. The NP2 s wide inductance range allows for use with small loops sometimes found in the Parking/Access Control industries (for recommended loop sizes please consult the Northstar Loop Information Guide). Separate indicators for power on, detect relay 1, detect relay 2 and fault provide for quick visual verification of proper operation. Loop diagnostics are easily viewed with the front panel fault indicator, differentiating between current and historical faults thus facilitating troubleshooting. Small size and full list of features lend the NorthStar Loop Detector - NP2-12/24 Single Channel to any Parking/Access Control use from simple presence detection to configured pulse/presence lengths with output extensions and/or delays. Extend switch 1 is for extending the detector output after the vehicle has left the loop. Switch 1 in the OFF position provides no extension. Switch 1 in the ON position provides a 5 second extension once the vehicle leaves the loop. This extension applies to relay 1 only. Delay switch 2 is for providing a 2 second delay, detector will ignore the vehicle until the vehicle has been present over the loop for 2 seconds. Switch 2 in the OFF position provides no delay. Switch 2 in the ON position provides for the 2-second delay. This delay applies to relay 1 only. Presence Time switch 3 provides for either a 1 hour presence or permanent presence. Switch 3 in the OFF position provides for 1 hour of presence. Switch 3 in the ON position provides for permanent presence. The above presence settings apply to relay 1 only. (Other options are available). Pulse Length switch 4 provides for either a 250mS pulse length or a 500mS pulse length. Switch 4 in the OFF position provides a 250mS (standard) pulse length. Switch 4 in the ON position provides a 500mS pulse length. Switch 5 and switch 6 OFF provides pulse-on-entry. Switch 5 ON & switch 6 OFF provides pulse-on-leaving. Switch 5 OFF & switch 6 ON provides for presence. Switch 5 and switch 6 ON provides a fault output. Sensitivity controlled by front panel rotary switch. Medium sensitivity is used for most applications; this is a setting of 4 or 5. Always use the lowest sensitivity setting that detects the desired vehicles. Frequency four separate settings controlled by front panel. - 2+0 = Medium High. - 1+0 = Medium Low. - Set to HI frequency. - Set to Medium sensitivity (5). - Extend/Delay in the OFF position. - Presence time set to 1 hour. - Pulse length set to 250msec. - Relay 1 = fail-safe. - Relay 2 = fail-secure. Relay Output Rating: 7A 277VAC/30VDC. Mechanical: 1 3/8 w X 3 3/32 h X 3 ½ l.
- Power Green, solid with correct power supplied. - Relay 1 Red, solid during detect. - Relay 2 Red, solid during detect. - Fault Yellow, solid during current fault, flashing for historical fault. Sensitivity Boost automatic during detect except in the highest sensitivity setting (9). - Presence lengths of 15, 30, 60 minutes or permanent. - Pulse lengths of 250mS, 500mS, 1, 2 or 4 seconds. - Extend times of 0, 2, 5 or 10 seconds. - Delay times of 0, 1, 2 or 4 seconds. - Relay 1 fail-safe or fail-secure. - Relay 2 fail-safe or fail-secure. Note: Bold indicates standard configuration from the factory. Note: The above connection is shown with correct power supplied and no vehicle present.